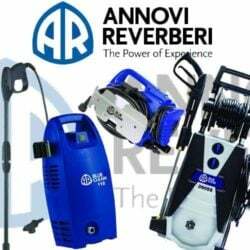 Annovi Reverberi - Find The Best Pressure Washer! Annovi Reverberi is a renowned company that is founded in 1958 and has a long history of making water pumps. For years they have been making diaphragm pumps for the agriculture and piston pumps for industrial washing. The company spread its business in five continents and reached very close to the market and the users. The expert technicians of the company are relentlessly trying to improve the quality of their machines. They got the perfect terrain for the company’s inception because of the founding partners’ skills, experience and the dynamic nature of the Italian manufacturing district. The company makes electric pressure washers. The products of this company feature with all the modern technologies and facilities. The company has a long history and reputation in making electric pressure washers. Their products are durable, featured with Total Stop System (TSS), GFCI power cord and many other things. The company understands the needs of the users and tries to make its products in accordingly so that the products satisfy the customers. The address of the company is ANNOVI REVERBERI S.P.A. VIA M.L. KING, 3 41122 MODENA, ITALIA; TEL. +39 059 414411 – P.IVA 02207040367.